1902 – June 2 born Elizabeth Halberstadt, Brooklyn, NY, tattooed seafaring father, seamstress mother. 1920 – Enrolled in the University of Washington. 1925 – Married Adolph Weinzirl, a medical student. 1937 – Moved to Portland, Oregon. 1947 – First tattooed by Max Pelz, of Portland a butterfly design, six months later was tattooed by Frank Martin, Seattle. 1947 – First tattooed by Bert Grimm. 1950s – Tattooed by Bert in Long Beach, California. 1958 – Featured in Jack Linkletter’s TV show. 1976 – Started going to tattoo conventions. 1976 – Voted Fan of the Year at the Houston convention. 1977 – Voted Fan of the Year at the Reno convention. 1979 – Voted Fan of the Year at the Denver convention. 1981 – Tattooed by Don Nolan. 1981 – The National Tattoo Association created the Elizabeth Weinzirl Award for the enthusiast of the year. 1984 – Featured on Japanese television. 1993 – Elizabeth died September 8th. 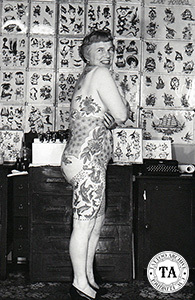 Elizabeth was known in the tattoo world as The Tattooed Grandma or The World's Number One Tattoo Fan . Elizabeth was first tattooed in the 1940s by the world famous Bert Grimm. Through the years Elizabeth had corresponded with tattoo artists and fans around the world. Known in the tattoo world as, The Tattooed Grandma or The World's Number One Tattoo Fa. 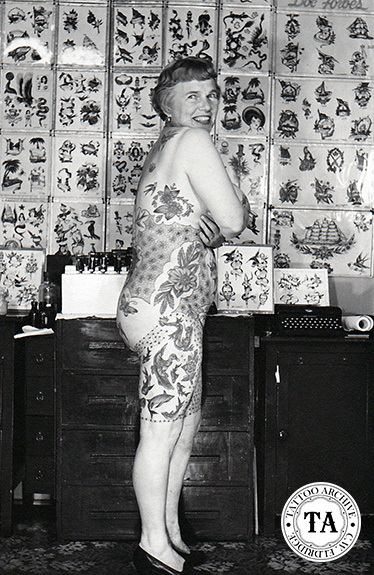 Elizabeth was first tattooed in the 1940s by the world famous Bert Grimm. Over the years Elizabeth has corresponded with tattoo artists and fans around the world.